A few weeks ago, my family and I were invited to a Summer Supper at Sudley Manor given by my sister-in-law's family. Once we learned the invite included all children and dogs, we packed up the family and headed west toward the Shenandoah Valley, excited to see family we hadn't seen in a while. Upon arrival, we were greeted with hugs by both family and a profusion of hunting dogs. Since Sudley Manor is owned by direct descendents of the Carter and Lee families, two of the oldest surnames in Virginia, the house brimmed with history. But my children were more interested in playing with their cousins and hitting the pool. The pool, hidden in a secret garden, had a beautiful view of the rolling Virginia countryside and the Shenandoah Valley. Although I was desperate to explore with my camera, and catch up with my sister-in-law, the kids decided to have a diving contest. Since they didn't trust us to judge fairly, they wanted photographic proof. So for the next few hours, I drank fresh-squeezed lemonade, chatted with the other adults, and caught children in mid-air. Oops! I got distracted by the amazing view! After an hour, I snuck away to check out one of the gardens. While most of the flowers were hiding from the intense sun, I did catch a few brave petaled souls and an iron wood nymph. But then the "Divisionals" started for the final dive scores! The dive competition ended with a dare for a back dive. The only one who completed the dare was also the only girl. After a wonderful afternoon swimming, playing with dogs, and spending time with those we love, we headed inside for a meal of cold fried chicken, corn and bean salad, and homemade cookies. All served with ice-cold lemonade, of course! Although it was too hot to eat on the patio, we had an amazing view from the dining room window. Finally, after many licks from dogs, hugs between cousins, and promises to see each other before Christmas, we drove away, secure in the promise that one day soon we'd return to Sudley Manor. A visual record defined by a single element, such as color, texture, or type. Previous journal entries include Studies in Purple, Stone Faces, Yellow, Bark, Iron Gates, Orange and Hide and Seek. I hope your days of summer are filled with joy, grace and ice-cold lemonade! Can be used as a veggie dip, a side sauce for grilled chicken or fish, or thinned with a dash of milk for a salad dressing. 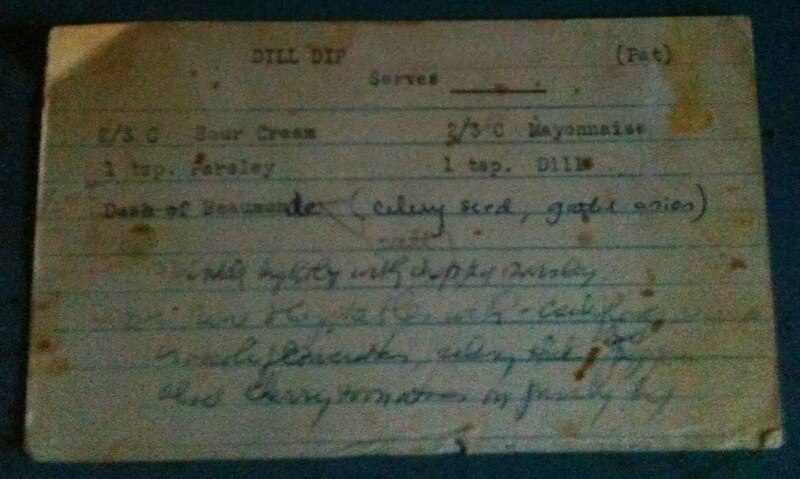 This recipe has been in my family for as long as I can remember. And it's still a huge favorite. I often toss it with cooked chicken, chopped Granny Smith apples (unpeeled), chopped celery, and chopped walnuts for a nice twist on chicken salad. 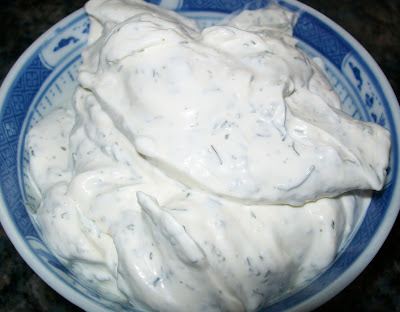 Or it can be used with cooked and chilled baby red potatoes and a chopped Vidalia onion for a wonderful potato salad. 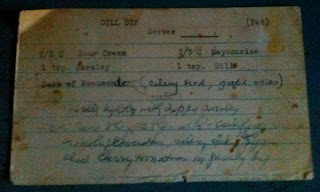 My grandmother's original card is difficult to read and never seemed quite right, especially since the spice Beaumonde (a combination of celery seed and onion powder) is difficult to find. After a few experiments, I changed the amounts and now use the recipe above. It tastes almost the same as the one my grandmother made. Although Summer is half over, I've been collecting days like drifting leaves, both in my memory and with my camera. It's a bittersweet chore because I know these days will be gone in a single breath, replaced by school clothes, pumpkin carvings, and Christmas plays. Hopefully these Summer journals will one day remind my children that although summers in Virginia were hot and lethargic, they once found an unbounded joy in just being. 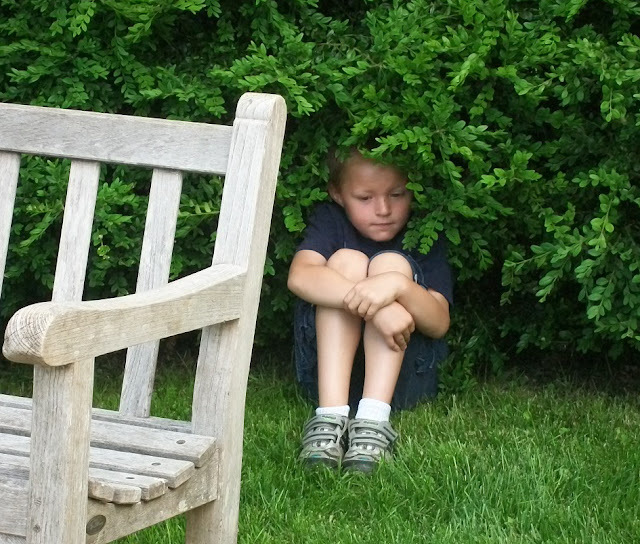 Hide and seek is a favorite with my children and their cousins. A lot of time and effort goes into the hows and whys. And the goal of our first picnic a few days after school got out? To play the most intense H&S game EVER in the walled garden at Oatlands Plantation. But first came the Serious Negotiation: Who will be on who's team? Girls against boys? Oldest versus youngest? How to evenly divide by age, experience, and speed. Strategizing by the reflecting pond with the Littlest, the Loudest, and the Oldest. Then came the Great Hiding! But where? During the Great Hiding, I knew my part. Carry the food, restate the rules (no leaving the Littlest behind, no trampling flowers), and follow discreetly with my camera. I hovered in the rose garden keeping quiet watch on the smaller children while photographing flowers. They were afraid my photographs of them would somehow be sent via super-secret satellite to the other team, giving away their exact locations, without realizing their laughter did a far better job. But once the first was discovered, the running commenced. 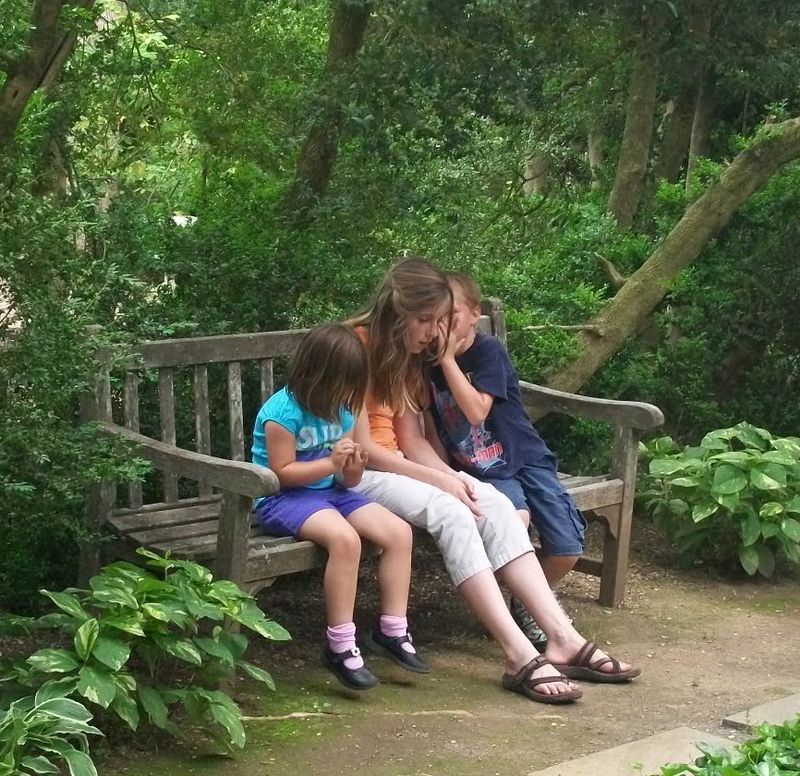 Time-out came fast and furious due to a butterfly flying by which the Littlest had to chase. While the Quietest found a reflection in the edge of the fish pond. And the Oldest went to find the cooler filled with ice-cold lemonade. Once everyone had taken a break, we went to the Upper Garden (a staple of Colonial Revival Gardens in Virginia) where the Fastest began the hiding and running all over again. Meanwhile, I stayed nearby (despite their protests), snapping photos, waiting for the Littlest to trip or the Loudest to be reprimanded by the Master Gardeners who'd arrived for a class on boxwood-lined parterres. Finally, when the lemonade had disappeared along with the dozen brownies I'd tucked away, the Oldest called the day's game a draw while the Loudest decided it was time to go home. So we packed up, with promises to come back soon. 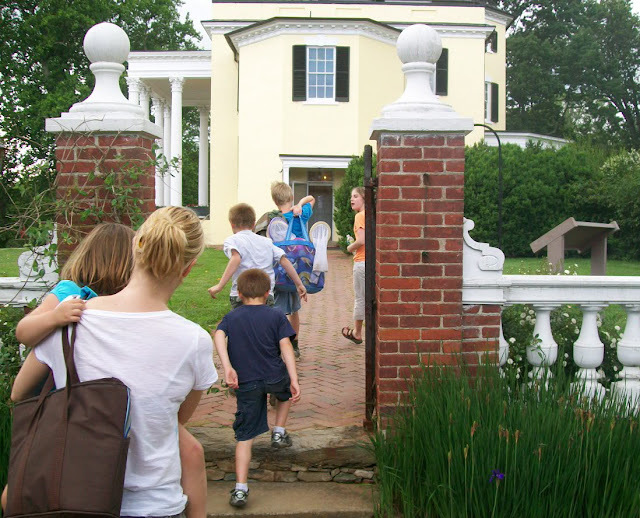 As we left, the children chattered about the weeks and weeks of summer ahead, anticipating the picnics and sleep-overs, and how school seemed years away. My sister smiled. She knew the truth. Time slips by quietly, hidden beneath the drone of summer crickets and the weight of unending humidity. And one cold November day, over silver trays of turkey and stuffing, she'll whisper to me, "Where did the summer go?" A visual record defined by a single element, such as color, texture, or type. Previous journal entries include Studies in Purple, Stone Faces, Yellow, Bark, Iron Gates and Orange. I hope your days of summer are filled with joy and ice-cold lemonade!